Just about every successful endurance athlete would admit that “recovery” is a critical part of a sound training program. They KNOW that fact, but have a hard time striking the appropriate balance between proper recovery and sustained workouts and training. Over the last few years as I have become more and more competitive with my racing and my performances and race times have improved I can easily attribute that to an increase in my training and the types of workouts that I routinely do. Hard work is still the mantra of the modern-day endurance athlete. Which is where problems can arise. We believe that “running on tired legs” improves our endurance. Nailing a workout when we’re a little under the weather “proves our toughness”. Running a set of hill repeats even though we feel tired and in need of a break is the right thing to do because, “they were on the training schedule”. So how do you know when you really do need a rest day? How do you KNOW that it is time for recovery, not time to keep pushing? Well, the folks at Restwise have put together a solution for the everyman or everywoman out there. Those of us who are serious about our training but do not have a team of doctors, nutritionists, massage therapists and coaches monitoring our every move. They have developed a program that takes the science of recovery out of the lab and puts it in the athlete’s hands. 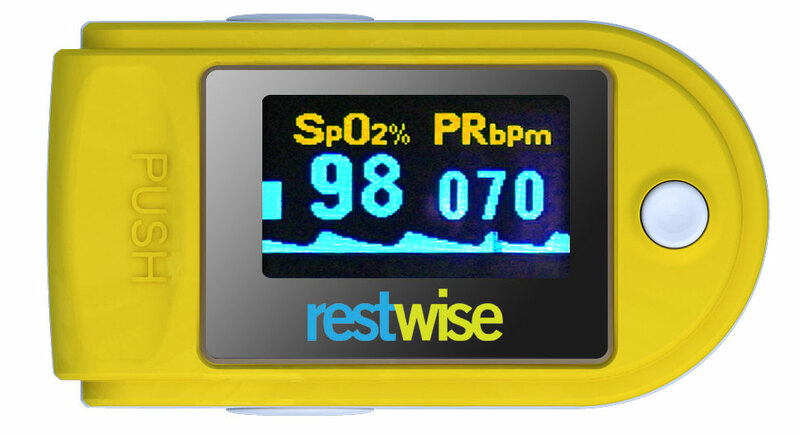 Each day you answer a brief series of research-based questions, enter data from a pulse oximeter (more on that in a second), and the resulting Recovery Score will quantify your body’s state of recovery. The pulse oximeter (which is included) clips on your finger and in 15-30 seconds records your resting heart rate as well as your blood oxygen saturation (SPO2) level. You self report your weight and the amount of sleep that you had the previous 24 hours, including any naps. (Naps? man does that sound awesome). Describe your energy level today. Describe your mood state today. Do you have sore throat, headache, nausea, diarrhea or other illness? Do you have any muscle soreness? Do you have an injury that is affecting your training? All of these questions are a simple selection of worse than normal, normal, better than normal or they are a yes/no question. Filling in my first day of data took less than 2 minutes including the reading from the pulse oximeter. The Restwise solution is one that they themselves describe as “simple”. 1. Identify the research-based markers that relate to recovery and overtraining. 2. Determine their relative importance. 3. Build an algorithm which folds all the data together in such a way that the resulting calculation is meaningful. 4. Wrap it in a web-based tool that doesn’t require a PhD to understand. 5. Generate a score that tells an athlete how prepared their body is for hard training. 6. Make sure it is accessible from the major handheld devices as well as the web. 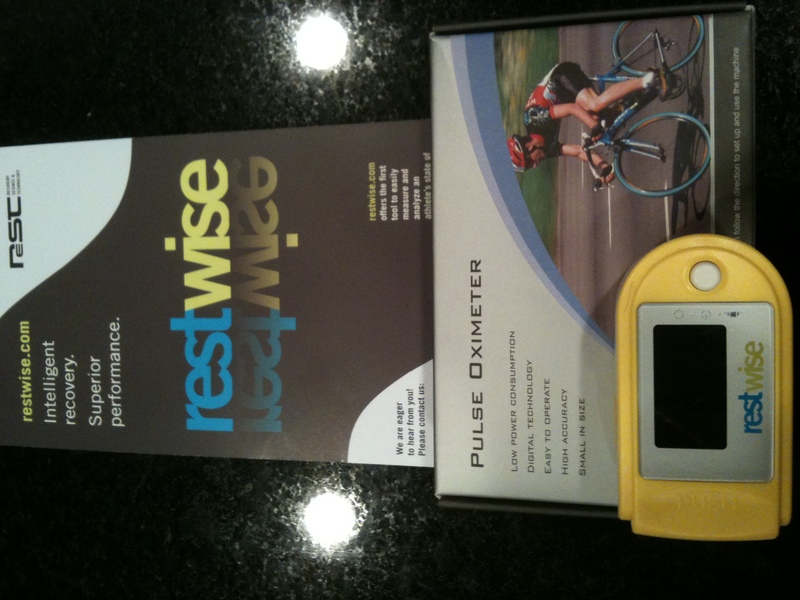 Restwise pulled together a small team that includes some of the best minds in exercise science, some incredibly experienced athletes and some “seriously smart math guys” to make the enterprise work. I reached out to Jeff Huntto tell him that after reading about Ryan Hall’s use of the system – leading to the fastest ever American Male Marathon time last year in Boston – I had an intellectual curiosity about the product/program. Jeff was quick to let me know that he would love to send me out a package so I could get started right away. Restwise arrived in 5 days - Thanks Jeff! I will be recording my data for 30 days to establish my “base-line” which will then give me instant, interpretive feedback letting me know when I am prepared to “train hard”and when I need some time to recover. “Without a way to consistently and easily monitor recovery levels, even the most thoughtful training plan can lead an athlete to overtrain. And the fitter you are – the more you have sharpened that “performance edge” – the more fragile you may be. Like thoroughbred racing horses, a race-ready endurance athlete is only a few hard training sessions away from disaster. My training this week consisted of a snowy, challenging 16-mile trail run on Tuesday, followed by a 12-mile up-tempo run :20/mile slower than marathon race pace and then 16 hours later another tough session of hill repeats on Thursday. As I was running my cool-down mile back to the house after my 10th and final hill repeat of the morning I knew that Friday’s rest day was coming at a perfect time. I had pushed hard for several days in a row and needed to recharge the batteries before this weekend’s 11 mile/21 mile workouts on Saturday and Sunday. 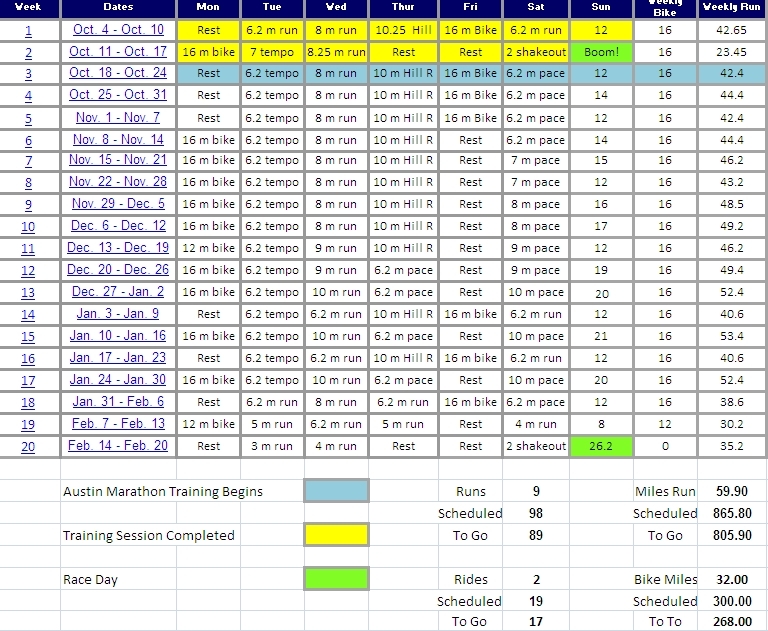 I thought a lot about Restwise on that mile back to the house and what it would have instructed me a month from now as I debated resting on Thursday morning and running my repeats on Friday – but being the dedicated athlete, training for the marathon of my life in Boston this April, I stuck to the schedule that I had written more than 3 months ago. I’m excited to receive the frequent e-mails from Restwise throughout the program as well as seeing my feedback on my daily reports. 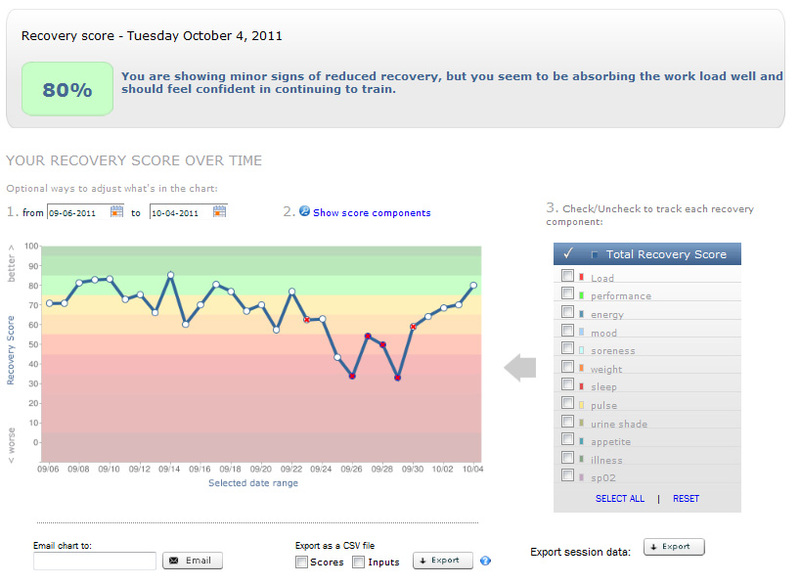 Ironically after just one day of entering data – Restwise informed me that I needed a recovery day. Those guys at Restwise must be pretty darn smart after all. Interesting Joe … I would say this seems like a very appropriate tool to complement your through training and supplement your already large volume of data and self awareness that you use so assertively to continue to find room for and ways to improve your already awesome performance levels. Hi Jim! Thanks for the visit and the message – I’m pretty excited about incorporating this into my training. I think sometimes in the past I’ve “known” I needed a break and soldiered on anyway because of a schedule or a poor training performance …. I’ve been to the edge of overtraining in the past – I’m hoping this can help keep me honest with myself, smart and injury free. Joe: Looks pretty compelling. Coming from a runner that’s had a lot of issues with overtraining, I’ll have to look into it. Hi Ty! It is going to be an interesting next couple of months as this portion of marathon training to me is really where you run the greatest risk of overtraining. I’ll be sure to share a lot of updates along the way. Hope you are doing great!